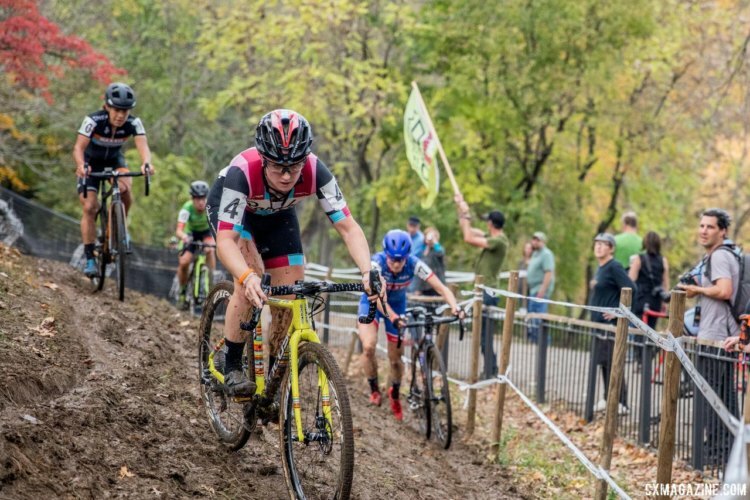 After six climbs of the Koppenberg on Wednesday, one could forgive Katie Compton (KFC Racing p/n Trek/Knight Composites) if she was tired of climbing and wanted to sit out Saturday’s race after getting a glimpse of the course at Joe Creason Park. 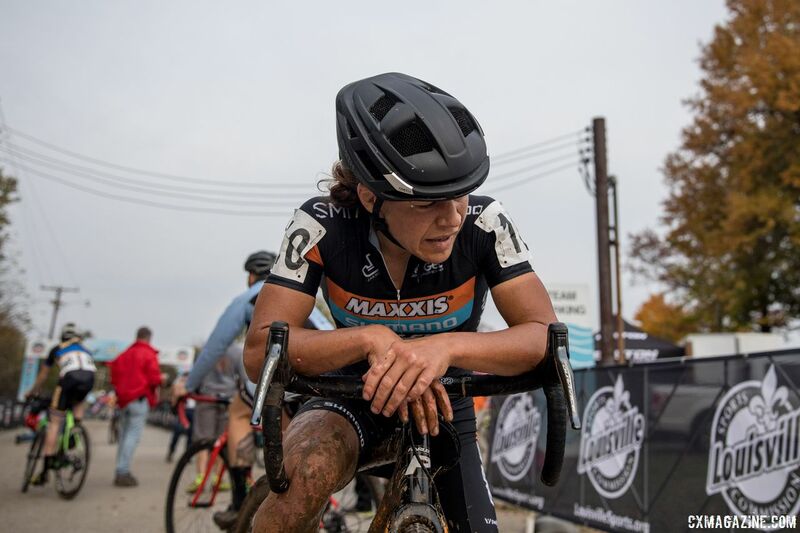 Never one to miss a good race, Compton headed to the start line for the Derby City Cup C2 and prepared to tackle a course that features three slow, boggy slogs in each of the laps of the Women’s race. 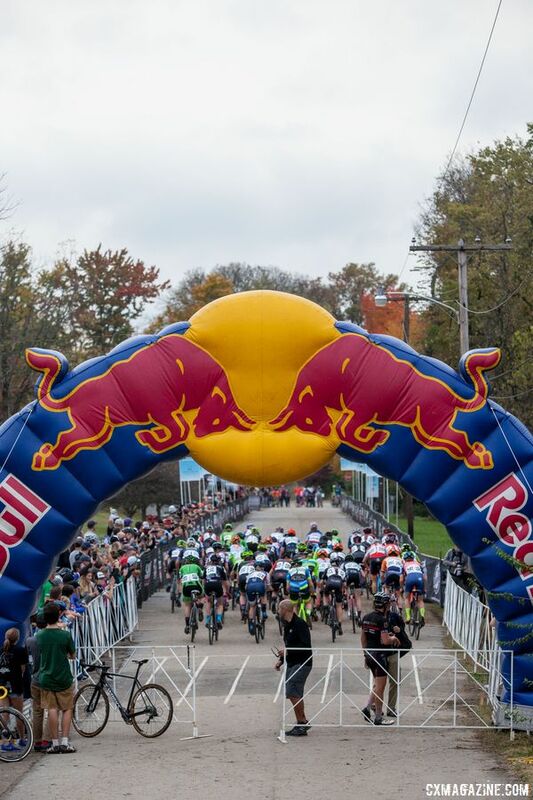 Saturday’s race was also the last of the seven-race US Cup-CX series. 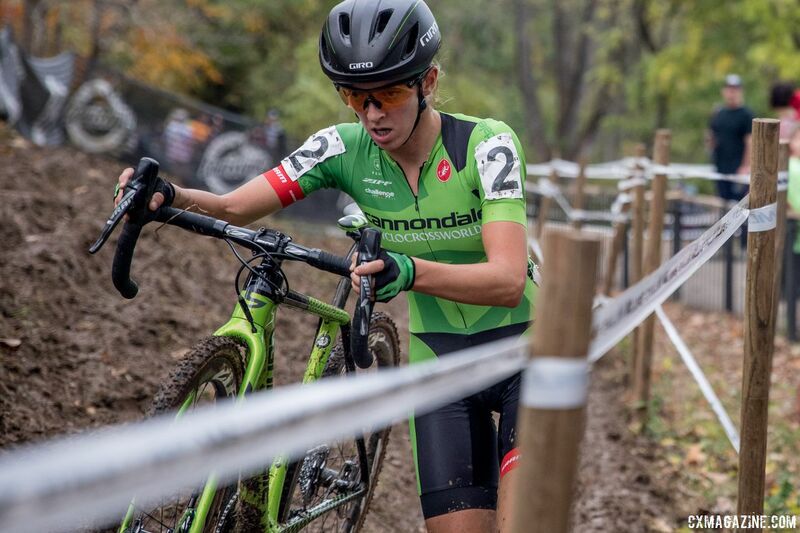 Kaitie Keough (Cannondale p/b Cyclocrossworld.com) came into the race with a nearly insurmountable lead in the chase for the overall prize, but there was still the potential reward of making it clear she is the deserving winner of the first U.S. cyclocross series since the USGP folded in 2012. 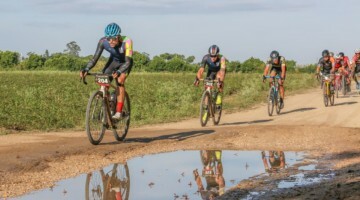 After over an inch of rain on Friday, conditions at Joe Creason were still muddy in the morning dampness, but the fog gave way to sun in the early afternoon and the course began to tack up. 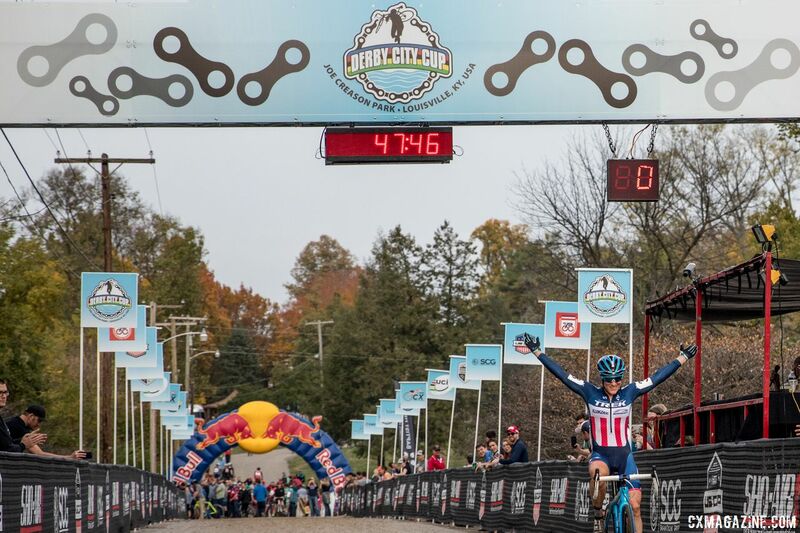 The course was still technical with a ton of climbing and there was work to be done to win the race. 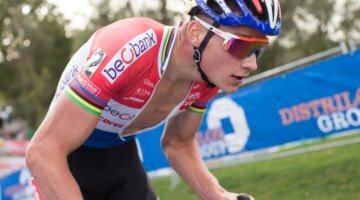 After racing in Europe for the last month, Compton was likely very at home on a course that had a Belgian feel. Keough and the others had their work cut out to knock off Compton at a race that served as a preview of the 2018 U.S. Cyclocross Nationals. Maghalie Rochette (Clif Pro Team) had a strong start to the US Cup-CX series, but gave up a chance to vie for the top prizes when she raced at Canadian Nationals last weekend. 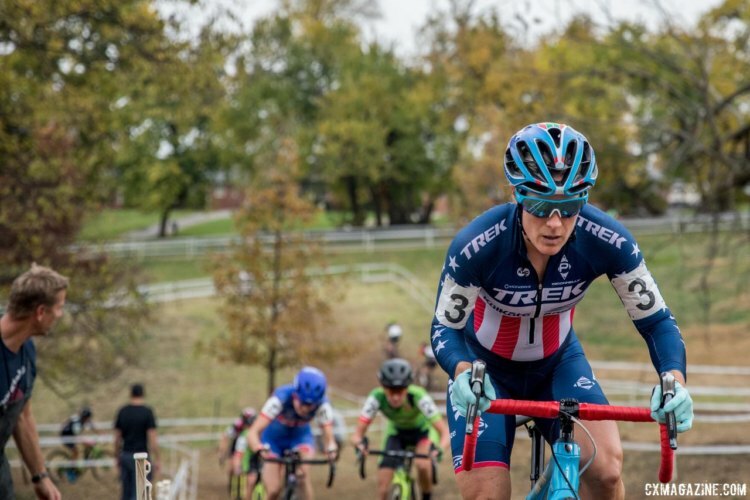 Rochette was back in the U.S. for Derby City and ready to get back to the hard racing the US Cup-CX series has engendered thus far. Rochette went out fast and led riders to the flyover for the first time. 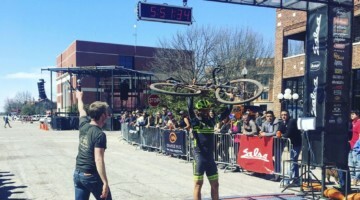 The second half of the course at Joe Creason featured three climbs. 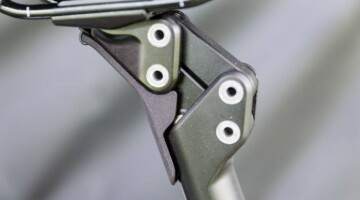 The first led to the off-camber and stair technical features, the second had a steep muddy climb into a long incline on pavement and the third led out of the section toward the finish line. When the front group hit the pavement on the second climb, Compton decided it was time to go. She pulled to the front and made the rest of the field decide if they were going to chase her. 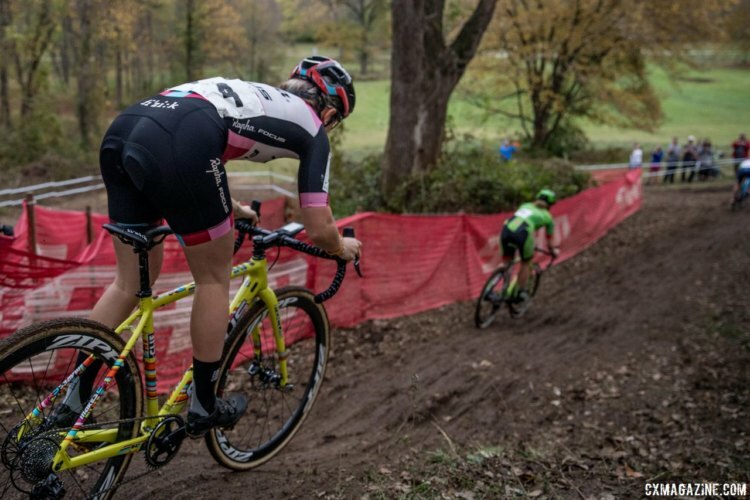 On this afternoon, Compton was showing no fatigue from the Koppenberg and the long plane ride to Louisville. 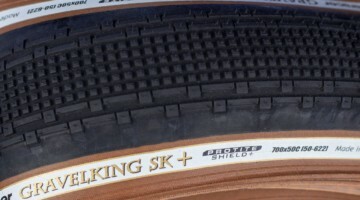 Riders tried to chase her up the third of the three climbs, but Compton stayed on the gas past the pit on the recovery. Only Keough could go with her. By the time the lead duo hit the stairs on the lap two, their lead back to third was 20 seconds. 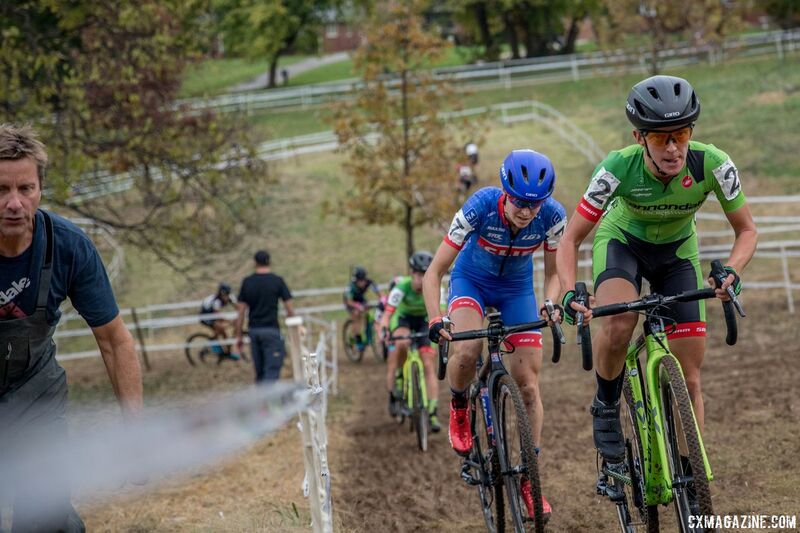 Behind them, Rochette, Ellen Noble (Aspire Racing), Emma White (Cannondale p/b Cyclocrossworld.com) and Crystal Anthony (Maxxis Shimano) grouped up to chase. 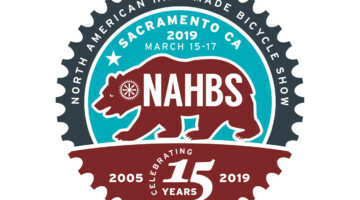 Compton and Keough on a hilly course? 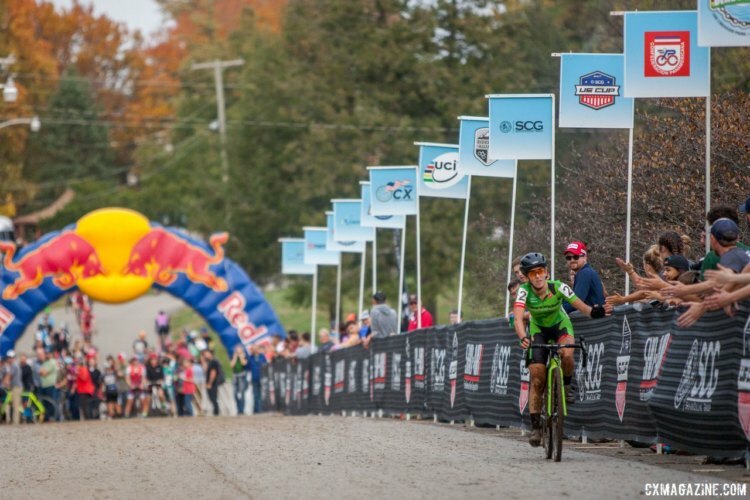 For a moment it brought back memories of Day 1 of Jingle Cross, where Compton and Keough battled into the night in Iowa City before Keough ultimately took the top honors. On Saturday, there would be no rematch. Compton pushed climb two and opened a gap. 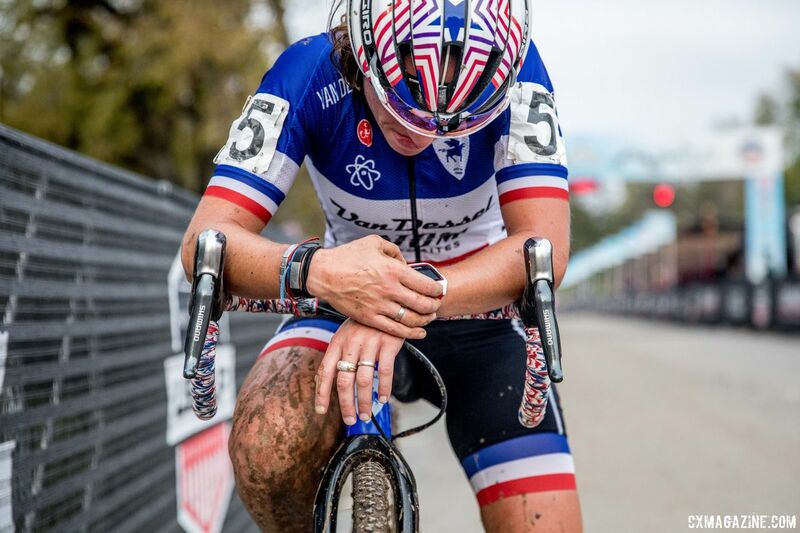 She kept pushing up the third climb and again applied the power through the recovery. Her lead was nine seconds after two laps, and when she hit the flyover for lap three, her lead was almost double that. 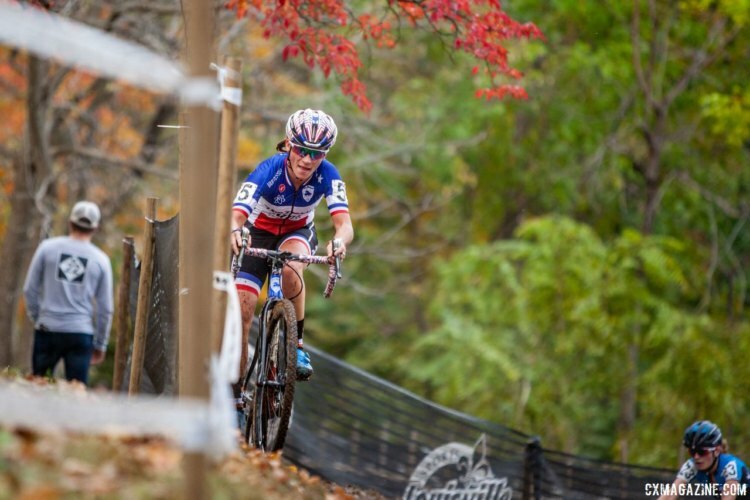 On the eve of the Pan-American Championships, Compton was on her way to reminding fans and the field that the jersey is hers to lose on Sunday. Keough’s consolation prize for the afternoon was a second-place finish and the $12,500 prize for winning the US Cup-CX series. 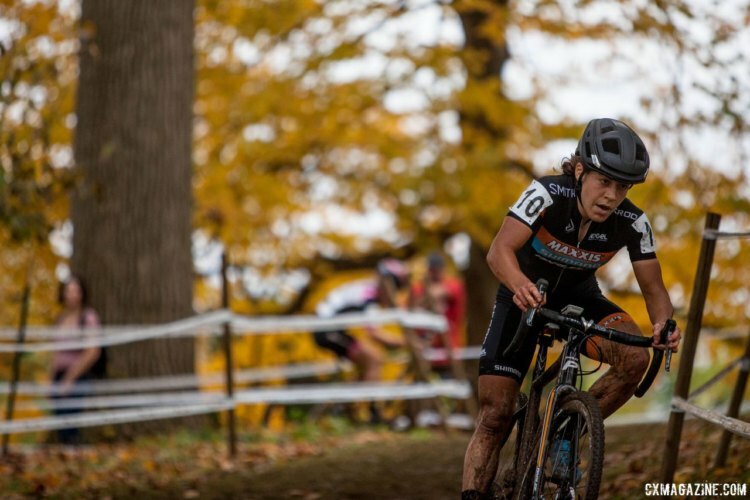 Keough led the in the series standings for all seven races after she took the first two races at the KMC Cross Fest. Once Compton and Keough were gone in lap 2, an exciting and fluid, battle for third took shape. 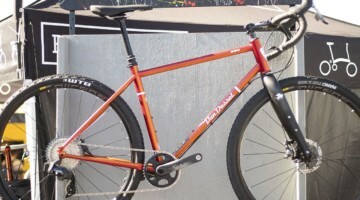 The early aggressor was Noble, who rode the stairs on lap two and picked up three or four seconds on Anthony and White. 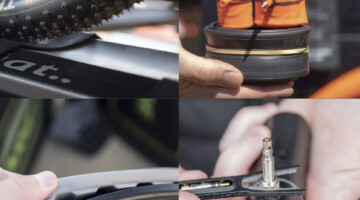 After the fast start, Rochette began to fade a bit as the climbs took their brutal toll. Noble had a gap, but Anthony quickly erased it on the next two climbs and took over third exiting the valley of the three climbs. It was her turn to be the aggressor. At the end of lap two, Anthony had seven seconds on White and Noble. Anthony has been a consistent top five to six finisher during the last several years, but she has not won a UCI race since 2015. 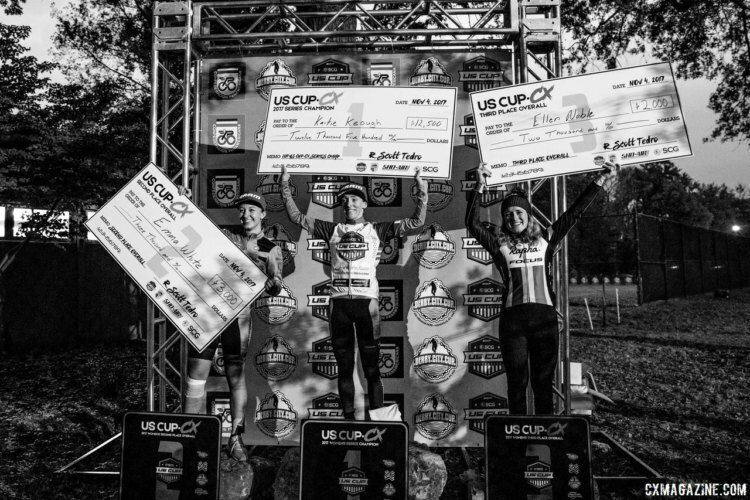 First was gone when Compton decided to go, but she still had a chance to grab a podium spot against a very impressive field going for it all in the finale of the US Cup-CX field. 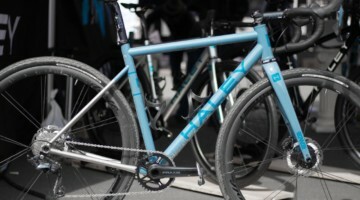 A third would be a great result for one of the most consistent riders in cyclocross. Noble is known for her technical prowess, and on the third lap, she made sure to take advantage of her skills. 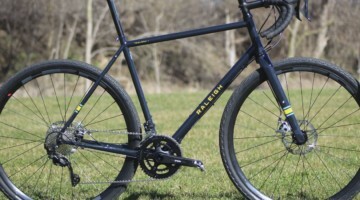 Sshe pulled to the front into the valley to set her own pace. The move paid off, and she opened up a sizeable gap back to Anthony. 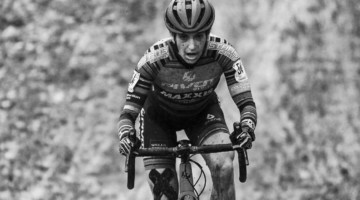 The Maxxis Shimano rider closed some time on the climbs again, but Noble was still in a good position with eight seconds heading into the penultimate lap. 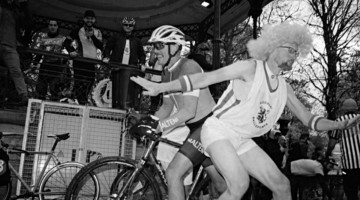 However, out on the course, conditions were heavy and the race was in flux. Nothing was decided. 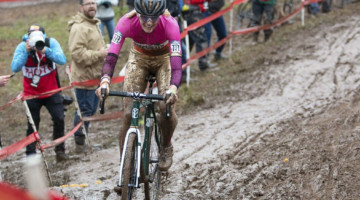 During the second lap, Noble pounced and exploited her advantage through the technical features. On lap four, it was Anthony’s turn to put the pressure on her fellow New Englander. 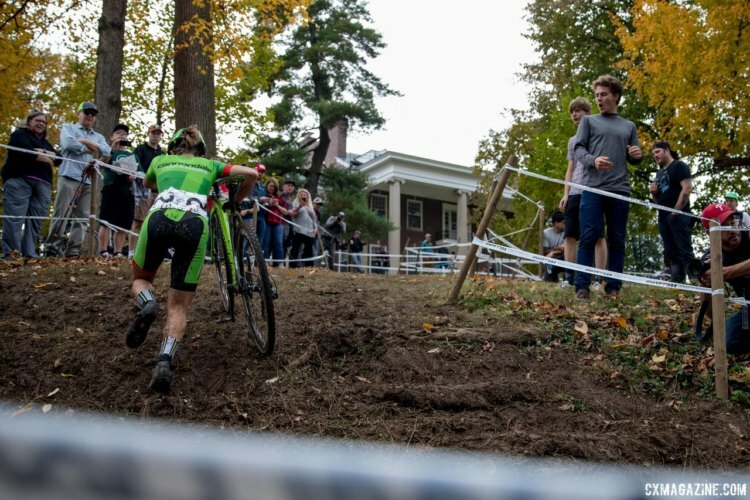 Anthony regained the advantage on the first climb and was the first to the off-camber section in the shadows of the Joe Creason Park mansion. 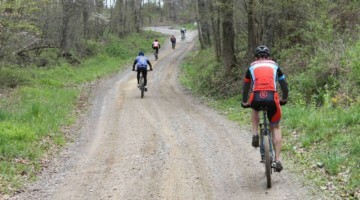 The exit from the off-camber section was a right-hand turn at a steep climb. 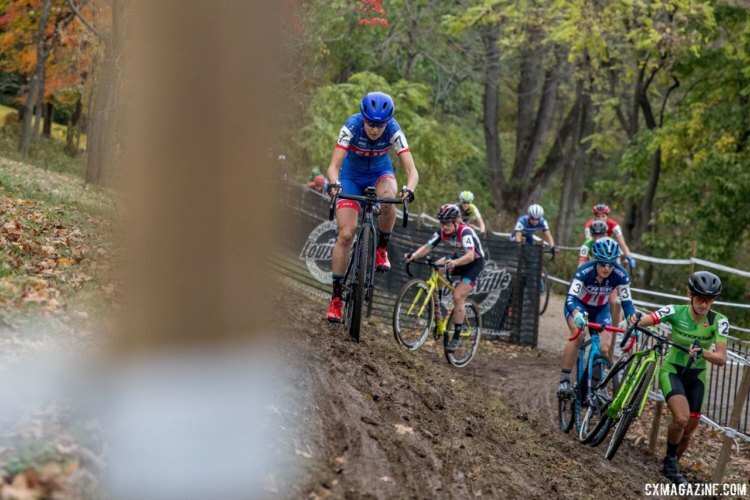 The feature got increasingly rutted and rooty throughout the race and by the time the women hit the course, the feature was a challenge for even the Elites to ride. On this lap, Noble struggled on her remount after the feature as Anthony pressed her advantage. Then the stairs that had giveth Noble a multi-second advantage during lap two, taketh away when she got held up on the third of the small hops. Anthony now had some breathing room in tussle that had been in flux since lap one. Her gap back to Noble was 11 seconds. Once clear of Noble, third belonged to Anthony. 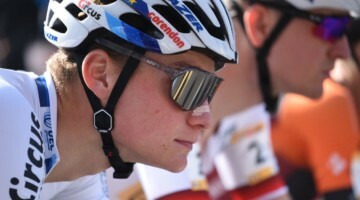 The podium was her second UCI podium of the season after she finished third at Day 2 of Gloucester. 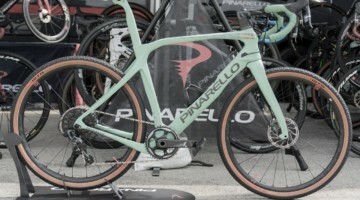 As Noble made her way up and down the valley, the threat to her wheel changed hues from White’s bright green to the blue, white and red of Caroline Mani’s Van Dessel / Atom Composites kit. 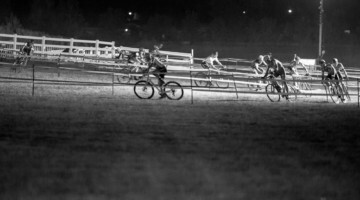 After a slow start, Mani came to life in the second half of the race and began picking off riders one by one. On the penultimate climb out of the valley, she caught Noble and then just kept going. During the last lap, Mani’s charge began to threaten Anthony’s hold on third. She closed some of the gap on the final climb of the final lap, but it would prove to be too little, too late. She settled for fourth and Noble took fifth. 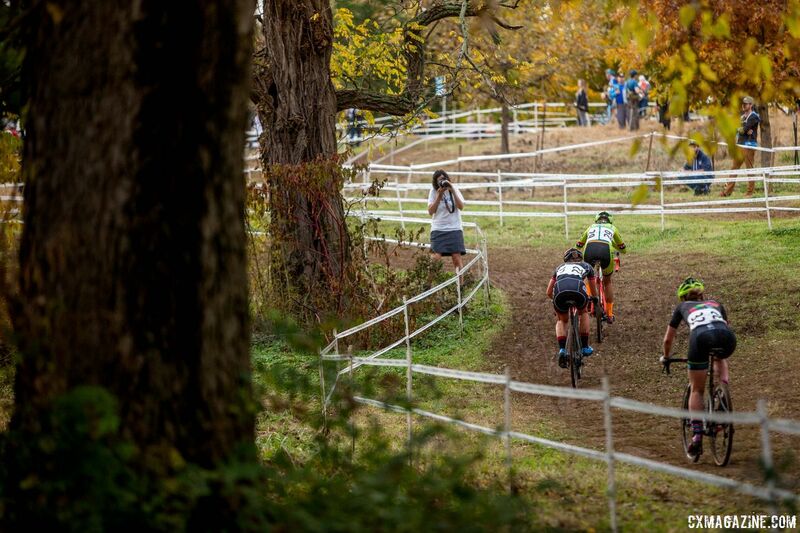 Saturday’s race marked the end of the seven-race US Cup-CX series. 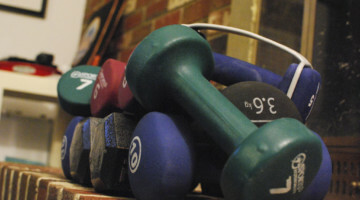 Keough took the overall first-place prize and the accompanying $12,500. 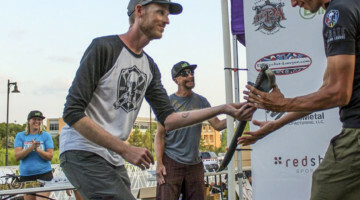 White took home $3,000 for second and Noble $2,000 for third. Stay tuned to Cyclocross Magazine for the continuing coverage of the 2017 Derby City Cup.